Consumer Product Reviews In a state required Consumer course, we worked with high school students to select a product and review a Consumer Reports summary, plus identified additional online sources of product evaluations. Magazines and Newspapers – these English Language Learners had a tour of the library, learned about a special collection of resources for them, met in our periodicals room on multiple days and selected stories of interest in preparation for creating their own newspaper. Zeitoun Background Research – these rising Juniors began researching about Hurricane Katrina and its impact, prior to reading Zeitoun. We were fortunate to be able to collaborate with librarians at other schools and colleges preparing for similar units. Using the list of Abraham Lincoln Book nominees from our state professional association, we devised an assignment to help rising Freshman practice using the library catalog and databases, plus gave them a tour of both the physical and virtual library spaces. Presidency Project - An advanced US History class (rising Juniors) came to the library on multiple days in order to locate primary sources and to create annotated bibliographies in support of a research paper, presentation and monologue about a US President. Debate: Interviewing and Company Research – these high school students learned about company information and interviewing techniques and questions in order to stage and critique mock interviews during class. Debate: Famous Speech – A library tour highlighted those aspects of our collections (plays, monologues and anthologies with speeches) for students to use in selecting a piece to memorize and present to their class. Teaching summer school in the library would give an overview of curriculum across multiple disciplines, an opportunity to collaborate with classroom teachers, and, most importantly, a chance to work one-on-one with students of differing abilities and motivations. Even more so than during the school year, some are freely pursuing a passion while others are merely attending because it is required. Mentoring a teacher undertaking a Practicum in Library Science, including supporting her professionally by attending a webinar and providing daily feedback. Even if Secretary Duncan will not be teaching summer school this year, it is worth considering the assignment of a little “homework” to Department of Education (DOE) staff in support of school libraries. In addition to the ideas listed here, what would you add? Visit a school and experience a day (or a week!) in the life of a school librarian. Libraries and librarians make a difference as research has shown for years. Secretary Duncan would recognize that, too, if he had the opportunity to teach and then to read the thank-you notes such as those I just received from summer school students. Yes, that was just one week of summer school in the library – and those notes were certainly a highlight! The school library blogs include quite a variety, amongst them commenters on our blog like Cathy Nelson and many other familiar names such as Nancy Keane (booktalks), Doug Johnson, Richard Byrne, and Carolyn Foote and Buffy Hamilton - this year's winner for The Unquiet Librarian. Rich is currently making the transition from English teacher to teacher-librarian at Sunnyside High School in Fresno, CA. 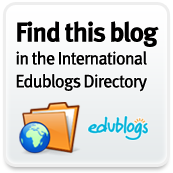 Web 2.0 tools, teaching strategies, and library research tools for educators. Carolyn is a high school and district librarian in Austin, TX. I am reading the book Is the Internet Changing the Way you Think? This series of essays by Edge contributors (about 150 in all) has a new perspective to offer on every page. * From MindShift Blog: "5 Personal Learning Networks (PLNs) for Educators"
* Shelley Terrell's "What will You Learn this Summer? 26 Professional Development Resources"
* Richard Byrne list "77 Web Resources for Teachers to Try This Summer". * Laura Turner's "20 Technology Skills every Educator Should Have" is from Tech & Learning and pretty daunting (she needed to publish a part 2 and part 3 - which I saw on paper.li), but the breadth of links is amazing. And in many ways it all started with Joyce Valenza's "How to retool yourself - a road map of at least 15 ways" or Helen Blowers' 23 Things which Alicia Duell will be reprising in her AASL presentation: "Facilitating Staff-wide “23 Things”-style Web 2.0 Learning Programs in Your School or Organization". Next on the reading list are Kevin Kelly's What Technology Wants and Eli Pariser's The Filter Bubble. Any ideas to share? Just learned about SpringerOpen: important open access to scholarly science journals which cover science, technology, and medicine (STM) fields. "The entire content published in a SpringerOpen journal is freely and permanently accessible online immediately upon publication. SpringerOpen views open access to research as essential in order to ensure the rapid and efficient communication of research findings. SpringerOpen is committed to maintaining high standards through full and stringent peer review." Springer Journals are known for quality; it is exciting to see the open access feature blossom and grow. Check out this very simple aggregator for a website "made in minutes"...great looking splash page/portal for an online identity that brings together social networks and other aspects of your online presence. This free service routes viewers towards aspects of your online identity you want to share including Facebook, Twitter, Flickr, LinkedIn, Tumbl.r, and a dozen more. 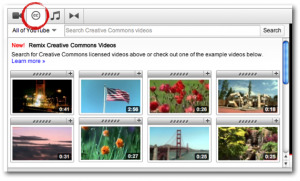 YouTube's new Creative Commons remix feature in its video editor! Students will be able to make their own videos and create mashups with documentary video from reliable sources such as C-SPAN, Voice of America and Al-Jazeera. Additionally, users will be able to publish any of their own videos under CC-BY simply by selecting the licenses as an option during the upload process. CC is hugely successful for Flickr images; YouTube's adoption of creative remix has huge potential for students' multimedia projects. We are fortunate at New Trier that YouTube is not blocked for students and that they can make use of this fabulous resource more fully.